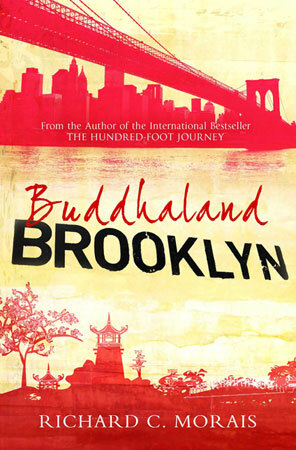 Book Review: Buddhaland Brooklyn by Richard C. Morais + Win a Copy of the Book! “As he approaches his fortieth birthday, the introverted monk Seido Oda is ordered by his superior to leave behind his peaceful refuge in the remote mountains of Japan and set up a temple in Brooklyn’s Little Calabria. There Oda is confronted with an uphill struggle to get to understand the ways of his new host country, and finds his patience and beliefs tested by a motley crew of misguided American Buddhists – a shock which will enable him to come to terms with painful memories of his past and finally experience that sense of belonging he has always sought. Buddhaland Brooklyn is, the author states in the acknowledgements, “purely an act of imagination and should in no way be taken as a doctrinal explanation of Buddhism”. In fact, he goes on to tell us, the particular sect of Buddhism mentioned in the book is entirely fictitious, although borrows from other strands of Buddhism. I guess I was a little disappointed to read this – I wanted this story to be true. It was such a good story, so well devised, that I really believed it would have to be based on truth. But it’s completely made-up – and for that Richard C. Morais deserves a lot of credit. The detail he goes into about various elements of the religion, and of Japanese culture, show that he has clearly done his research enough to be able to make up such a convincing world. it wasn’t just the Japanese side of things that I found convincing, either; Morais describes an Italian funeral in such incredible detail that I could easily believe he had attended one. Apart from some of the dialogue, which at times I felt was a little cheesy and slightly Yoda-esque, the book is well-written. Both the peaceful mountains of Fukushima and the lively streets of Brooklyn are described in such detail that I almost felt as if I was watching a movie at times. Having been both to the mountains in Japan and New York City, I felt I could easily imagine the scenes and let them come to life in my own imagination. The Yoda-esque dialogue was a shame though – at times our lead Japanese character seems to speak fluent English, and then suddenly he can’t express himself and slips into broken sentences. The use of Japanese in the book is largely unnecessary too, I thought, with it mostly slipping away by the middle of the story anyway. Seido Oda’s story is complicated, and I won’t say too much here because I don’t want to spoil it for other readers, but it’s basically a story of coming to terms with loss. We all face different kinds of loss in our lives – loss of loved ones, acquaintances, people who couldn’t be helped, places, things… and loss is one of the hardest things to deal with, whether you have religion to guide you or not. Seido’s story is delicately handled, and the Hollywood ending I thought we were heading for fortunately gets side-stepped for a much more realistic finish. I was dubious at first, I admit, but by the last few chapters I was absolutely hooked, and found that I cared so much about the characters. Definitely one to read! Read an interview with the author here, and find out more at Alma Books. Would you like to win a copy of Buddhaland Brooklyn? I have two brand-new paperback copies of the book to give away! Simply leave a comment below by Friday 31st May to be in with a chance of winning. *Please note that winners must be based in the UK and must provide a valid email address when commenting. Winners will be notified by email after the closing date of this competition, and books will be sent by post shortly after addresses are received. Looks like an interesting theme for a book. My dad is a Buddhist in his forties and is meaning to become a Buddhist monk once me and my sisters grow up. It would make a great Fathers Day gift! I’m reading Extras at the moment, the fourth book in the Uglies series by Scott Westerfield and currently my favourite, partly as the new main characters are subtly Japanese. I’m also supremely excited about The Wolverine, the new xmen film set in Japan. I’m always looking out for new books and films featuring Japan, as it helps fill the gap before I can visit again.